The second in a short series of perusals of vintage beauty booklets – this one again from a 1930s beauty booklet by Rose Laird. This comes courtesy of Cosmetics and Skin – whose growing collection of scanned beauty booklets is a treat to browse through. Have you ever noticed how much longer a man’s throat retains the firmness of youth? There’s a reason. Daily shaving with a cream base gives him a form of massage. He exercises the mouth, cheek and chin muscles automatically to get a smooth shave, thus stimulating every little muscle. He starts this beauty treatment in his teens and keeps it up to his dying day. I have advised three quick and beneficial exercises to accomplish the same results for the woman. 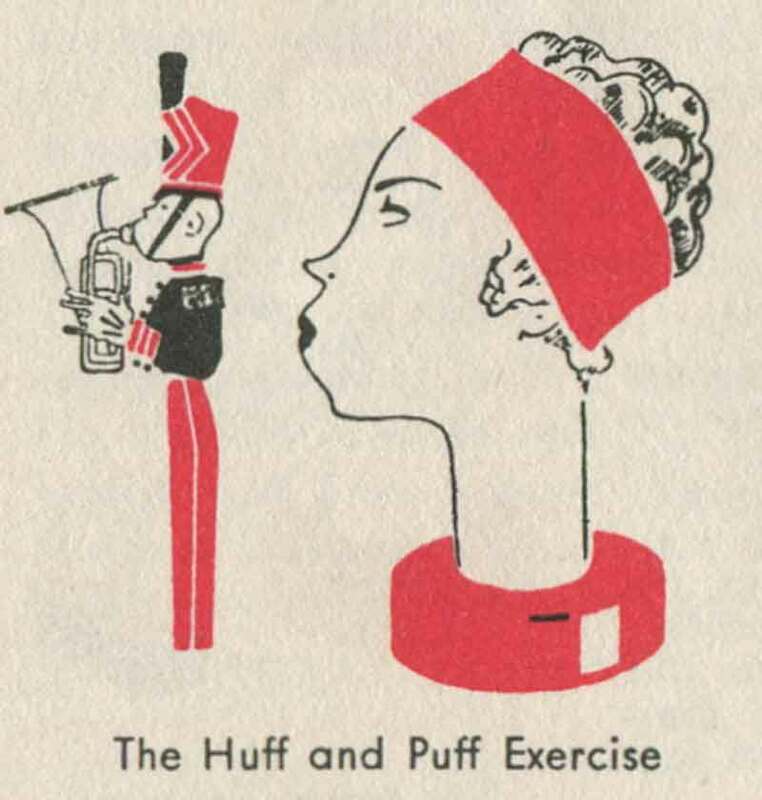 The Huff and Puff Exercise. Try this for those downward worrisome lines from nose to mouth. Fill the mouth with air and puff hard against the inside of your cheeks and upper lip. Keep your lips slightly open and release the air in energetic little puffs exactly as if you were playing a horn. 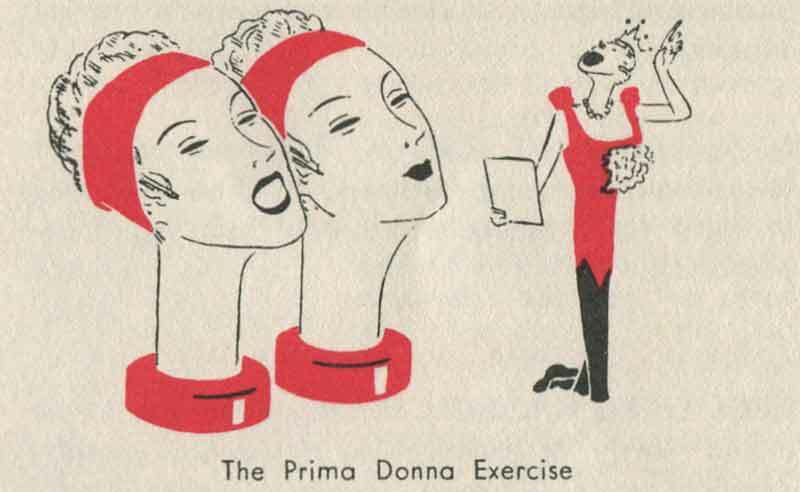 An amusing exercise that does much to improve the neck, throat and eyes. 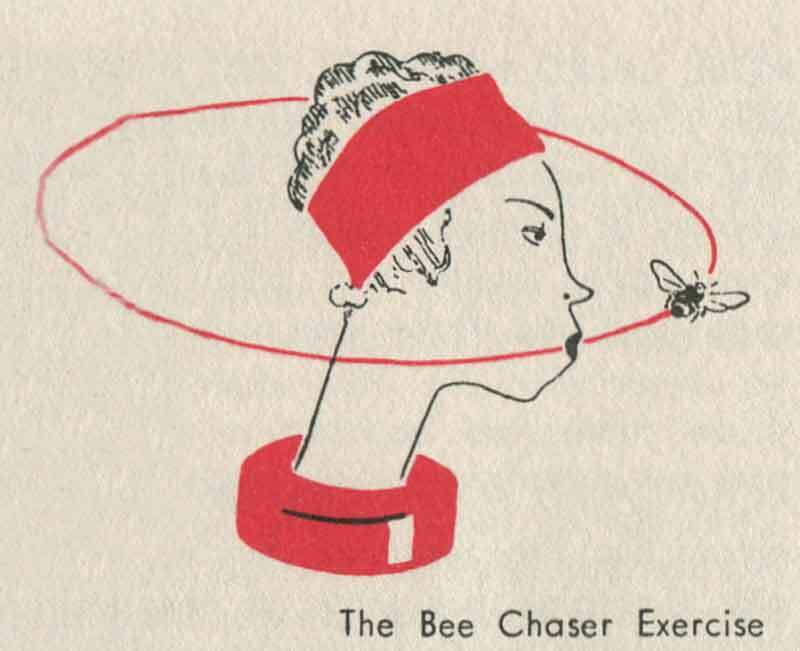 Fill your mouth with air as in the first exercise but rotate the head while you huff and puff, as though chasing an imaginary bee, and roll your eyes watching the bee. In this way your eyes will receive strengthening exercise. This one strengthens the muscles of the throat but acts on the fatty cushion that settles at the back of the neck and is a tell-tale sign of age. Tilt your head back, open your mouth wide, your eyes to the ceiling. Then slowly close your mouth by pulling up the lower jaw, feel the tension under the chin. Hold your head in this position for an instant. Then lift the head to the normal position by pulling up the cords at the back of the neck as though someone were lifting up your head by the ears. You should feel the muscles pull taut right down to the waist. 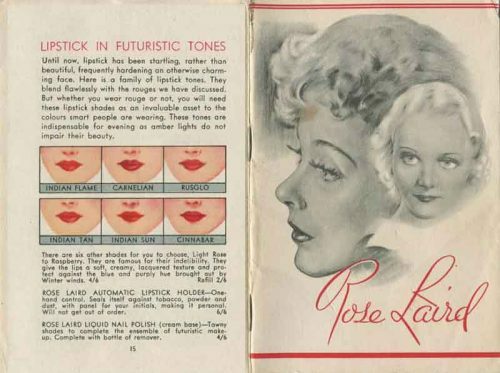 Check out Cosmetics and Skins growing collection of vintage beauty booklets, and if you have old booklets in your collection you would like to add to the collection, send James your scans.